The wait for the first apricots is finally over. Every week we rush into our greengrocers asking Shakit if the apricots have come in, ‘No girls’, he says ‘soon though’. And this week there they were, peachy orange with their flushed cheeks waiting to be picked. Although still a little hard we took home great handfuls of the sweet little fruits. This is one of our favourite breakfast dishes, so simple and clean, just to be served with some Greek yoghurt, pistachios and bee pollen. And it works well with slightly under-ripe apricots. This dish can quite easily be served as a light dessert and would go very well with any creamy number, like a pannacotta or vanilla ice cream. The sweet smell and their lightly fury skins bring such happiness, memories of hot summer days in the Mediterranean and picnicking in the shade under a tree. Apricots can be hit or miss, sadly for us having the imported under-ripe ones we often get the fluffy slightly more tasteless ones, if this is so then poaching or roasting them is the best way to go. Popping them in a hot oven with a drizzle of white wine, soft brown sugar and thyme make a delicious dessert. Around this time last year, we were out in Tuscany helping out a friend on a yoga retreat while recceing for our own. The next door neighbour, a sweet little old lady brought over a basket of fresh apricots, we have never tasted an apricot so delicious, the memory will stay with us forever. When out of season this is a nice recipe to make with dried apricots, keep in the fridge and it will last a good week, serve it with granola and yoghurt, or on cooler days with porridge. 1. Place the water, honey, bay leaves, cardamom and lemon in a small pan, place on a medium heat and bring to a simmer. Cut the vanilla pod in half lengthways, scrap out the seeds and add both the seeds and the pod to the pan. 2. Place the apricots in the pan and poach for 5 – 10 minutes till starting to become tender. Take out and place on a plate. Boil down the remaining liquid for about 10 minutes to make a syrup, take off the heat and add the orange blossom. 3. 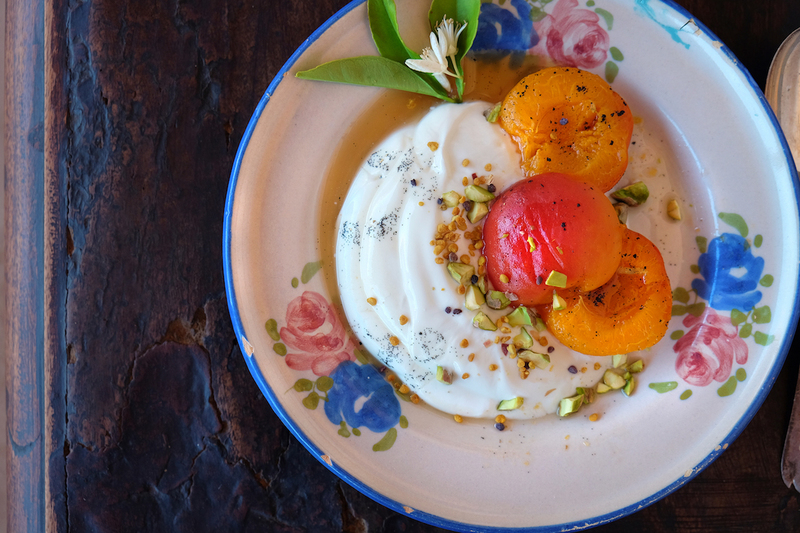 Spoon the yoghurt into bowls, then carefully place the apricots on top and drizzle over the syrup. Finish with a sprinkle of chopped pistachios and been pollen.